Back folds down - Carbon steel frame with silver powder coat.. Comfortable nylon upholstery - Seat belt for safety. Lightweight and durable aluminum frame. Rear handles fold down for easy storage or transportation. Lightweight and easy to store or to travel with. Swing-away footrests & padded armrests. Powder coated aluminum frame is lightweight and durable. Attractive silver vein finish - Seat belt for added safety. Swing-away footrests & padded, removable desk-length armrests. Equipped with parking brakes, 18-inch square nylon seat canvas. Lightweight and compact; folds easily. 400-pound weight capacity and 22" seat width. Padded flip-back armrests. - Fold-down footrests. Weighs only 19 lbs. Easy to push or transport. 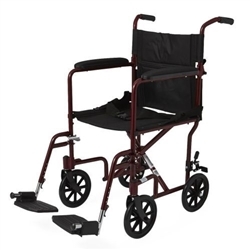 450-pound weight capacity - Reinforced steel frame for additional support. Heavy-duty nylon reinforced upholstery - Removable and reversible desk length arms. Yes, It Converts from a Standard wheelchair to a Transport Chair in just seconds! 500-pound weight capacity and 24" seat width. 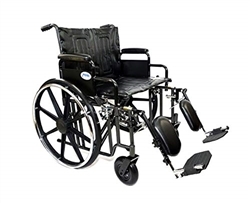 The heavy duty chair also comes standard with a set of anti-tippers as well as elevating legrests and is engineered to maintain a weight capacity of 400 lbs. Features removable desk length padded armrest and swing away removable footrests with height adjustable footplates. It supports up to 450 lbs due to its reinforced steel frame. Ergonomic seating! Not just a fancy sales term, but a functional part of this chair. 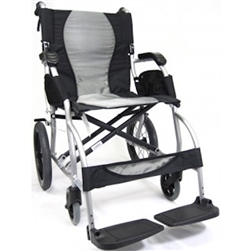 At a mere 25 lbs in weight with detachable foot rest and many feature. 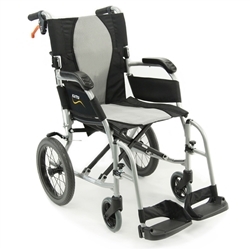 S-Ergo Lite Transport Wheelchair weighs only 18 lbs. and features an ergonomically-designed seat and backrest. Built in AEGIS anti-bacterial cushion provides added comfort and support. Revolutionizing and pushing T6 Grade Aluminum Geometry and Technology to its best to compete with Titanium saving YOU more than 71% in price! Easly put GoxCy 30 in your car trunk to go out and about. 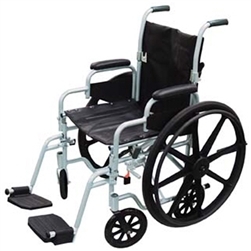 A transport wheelchair or companion wheelchair is designed to be propelled only by another individual and is sometimes referred to as a rollabout chair. Transport chairs have four small wheels. 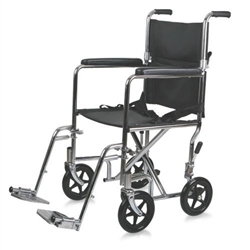 They come in different widths and weight capacities and are usually the same basic frame as a standard manual wheelchair. 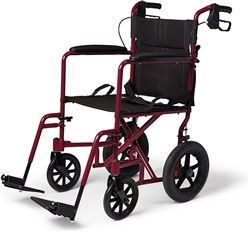 We even carry a combination of a transport and standard wheelchair called the Drive Polly Fly. 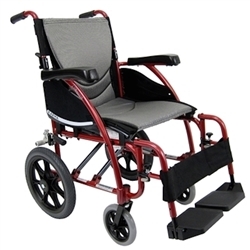 This chair offers both different styles of wheels and quick removal making it a transport chair in minutes!